The emblematic character of the architecture is consolidated, in an irrevocable way, over time. However, the status of the new court building in this expansion area of Puerto del Rosario required a special reflection on the formal response of the proposal. Language represents, as a means of communication, one of the most remarkable achievements of our civilization. The development of a judicial language, precise, and at the same time in continuous updating, is undoubtedly one of the most evident signs of the capital importance of the word in our society. 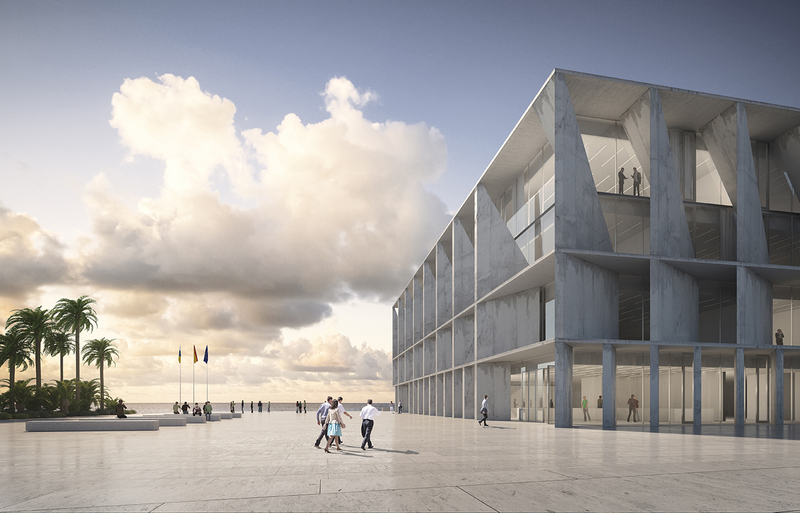 Our proposal gives the envelope of the building an essential tectonic role. Its presence and complexity respond to parameters directly related to the search for a sustainable architecture, balanced between means and ends. First, the exterior manifestation of the facade is part of the structure. Through the concrete screens, the structural forces are transferred to a perimeter axis, freeing as much as possible the space allocated to the complex program, and guaranteeing a high margin of flexibility in possible modifications. Secondly, the geometry and layout of the façade protects the interior envelope of the solar incidence with the greatest impact on the thermal functioning of the building, without renouncing optimal lighting conditions. The sustainability required in the new building is resolved with these and other passive decisions, as well as the choice of low maintenance materials. This shell houses and protects a luminous and flexible glass box. A dry construction that allows the interior spaces to be reconstructed with simplicity. The continuity of the concrete in the interior slabs moves the weight of the installations to the technical floor, contributing to give the building a great flexibility. The ultimate goal is to design with few materials and low maintenance criteria. Finally, through the aforementioned material, manipulations of the scale and structural rhythm have been intended to respond to the condition of an iconic building, a singular point in the still blurred outskirts of Puerto del Rosario.